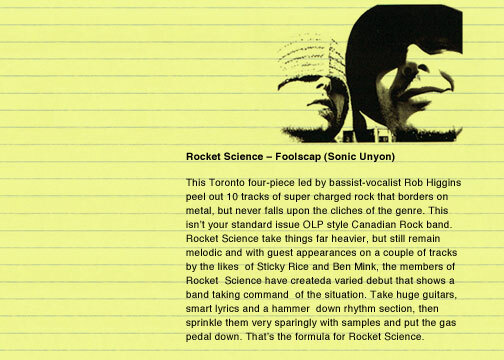 "Intent is pretty important," says Rob Higgins, bassist/vocalist for Toronto's Rocket Science. He's discussing songwriting as he reclines in a lawn chair on a warm summer night. Together for two years, former Change Of Heart member Rob Higgins, Richard Faima (guitar), Gordon Reilly (guitar) and Daniel Cornelius (drums) try to throw the spotlight on their songs rather than focus on the band's ability to crack you over the head with their uncanny command of their instruments. Although the band's soon-to-be-released debut (the Geddy Lee produced FOOLSCAP) features heaps of tasty chops, Rob believes that the recording was also a bit exercise in restraint. "It's the songs first these days and when those spots [to unwind] find themselves then..." he trails off with a laugh, adding, "Live it's a different scenerio where we don't feel that we have to just play our songs - we can stretch out and have some fun." That stretching, a sense of going beyond is something that relates to Higgins' childhood dream of being an astronaut, which just might hint at the origin of the bands name as well. It's been said that rock 'n' roll isn't rocket science, but Higgins and crew are going to try to take it that way. Rocket Science's material on FOOLSCAP changes gears from the hammer dropping OLP-meets-Primus slam of "Losing An Edge," to the low-end funk punch of "Stop," to the lonely slide guitar-driven wail of "Poisonous Gasses At Supermarkets." It all shows that the band really know how to mix it up when they want to. With a high-profile Canadian rock legend in the producer's chair for FOOLSCAP, you've got to wonder what the band expected from Lee. "I think that the producer's role is to serve the song and to help the band realize what they're trying to realize and at the same time offer insight into putting songs together," Higgins answers thoughtfully. Recorded at Geddy's home studio, Reaction and the Signal To Noise studios, FOOLSCAP does anything but make you want to sit back and relax. "It's about stretching - going beyond and reaching for something," says Higgins.